In order to slow the speed of the pump down, to be able to achieve longer life of the bearings and seals, a gear-reduction system needs to be installed. This assembly will be positioned between the pump and the engine that is turning it. 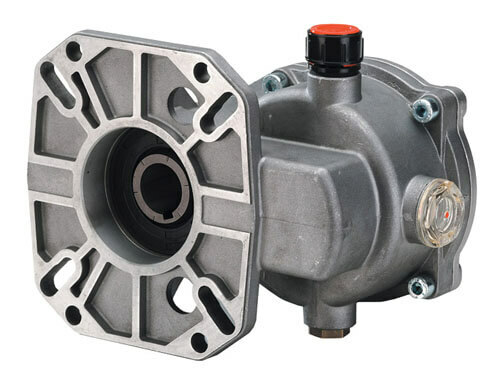 Gear Drive installation will not only keep the heat transfer down, but will make the pump turn at half speed which will result in longer life of the pump bearings and seals. This consequently makes such machines industrial and allows them to run 40 hours or more per week. We offer the highest quality heavy-duty gear boxes to fit your pressure washer with a simple bolt-on installation. They have the highest dependability and strength ratings on the market. Whether your pressure washer ranges from 13h.p. to 24h.p. we can get it to you quickly at a great price. These heavy-duty pressure washer gear boxes are built to last through to toughest of conditions. They work on AR, Comet and General pumps.